This PDF 1.5 document has been generated by Microsoft PowerPoint - Otis Elevator Information San Diego.ppt [Compatibility Mode] / Nuance PDF Create, and has been sent on pdf-archive.com on 11/04/2016 at 22:52, from IP address 70.211.x.x. The current document download page has been viewed 413 times. File size: 181 KB (2 pages). elevator that ensures maximum performance. Number of years in elevator through our e*Service® system. type of elevator, with many over 15 years in the industry. to get the parts we need, when we need them. tools needed to put your elevator back into service quickly. We are in the neighborhood! your service needs the fastest among local providers. we have a mechanic right around the corner! spent years servicing non-Otis equipment. 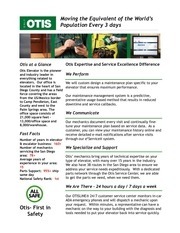 OTISLINE service in English, French, and Spanish. operation for passengers. For that reason, Otis is First in Safety. This file has been shared by a user of PDF Archive. Document ID: 00359259.